Plot app 0. 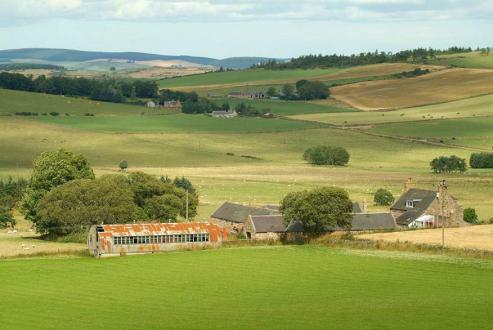 8 acre with steading suitable for conversion into 1 or more residential units. Price over £140,000 Entry by arr. Viewing go along to site. Viewing go along to site. LOCATION: On a superb site extending to 0.8 acres or thereby, with a great outlook across rolling countryside, this SUBSTANTIAL STONE BUILT STEADING enjoys a quiet rural position and offers excellent development potential for conversion into one or more residential units. The property is near the villages of Lumphanan and Tarland. Alford lies to the north and is well served for everyday amenities including a wide range of local shops, a post office and primary and secondary schools. Leisure facilities include a Golf Course, swimming pool and a variety of other indoor and outdoor pusuits. Aboyne on Royal Deeside is a short drive away and also provides excellent primary and secondary schools situated alongside the Deeside Community Centre, which includes a swimming pool, squash courts, games hall, fitness room, theatre and library. There are a number of outdoor pursuits also available, including hill walking, golf, tennis, lawn bowls, fishing and gliding, while the ski centres of Glenshee and the Lecht are within easy reach. Aberdeen city is under 30 miles away, making the journey duration approximately 45 minutes outside peak traffic times. Alford itself is well served for everyday amenities including a wide range of local shops, a post office and primary and secondary schooling. PLANNING PERMISSION: Planning permission has not been applied for and this will be the responsibility of the purchaser. It is believed that Aberdeenshire Council would be sympathetic towards an application for conversion of the steading to residential accommodation but potential purchasers will need to satisfy themselves in this regard. SERVICES: Mains water and electricity are nearby. Drainage will require to be to a septic tank and soakaway, both located entirely within the site. ACCESS: As per location plan. DIRECTIONS: Travelling on the Aberdeen to Tarland road (B9119), at the Crossroads Hotel turn right taking the road to Alford (A980). Continue along for approximately 1 mile, then exit left at the signpost O'Neil/Corse. Travel along for approximately 2 miles, passing O'Neil Corse School and Norham access track is on the left. A location plan attached. SAFETY NOTE: The buildings are old and potentially unsafe. Viewers are advised to exercise caution when viewing.While the foregoing particulars are believed to be correct, they are not warranted and do not form part of any contract.